If this is your first time traveling to Penang in Malaysia, one of the questions on your mind is probably where to stay in Penang? The good news is that Penang has no shortage of accommodations on offer. Whether you are looking for that once in a lifetime luxury hotel, a small intimate boutique hotel, a beach resort, a value-for-money mid-range hotel, or a budget guesthouse or hostel, Penang will not disappoint. We first visited Penang in 2005 when it was a favorite stop on the South-East Asia backpacking trail. The minivan dropped us off on Lebuh Chulia Road in the middle of backpacker central and we, along with a dozen other backpackers, went door-to-door in search of a hostel. Things have changed a lot since then! When George Town became a Unesco World Heritage site in 2008, it started attracting visitors from all over the world who come to marvel at the uniquely preserved architecture of this fantastic city. 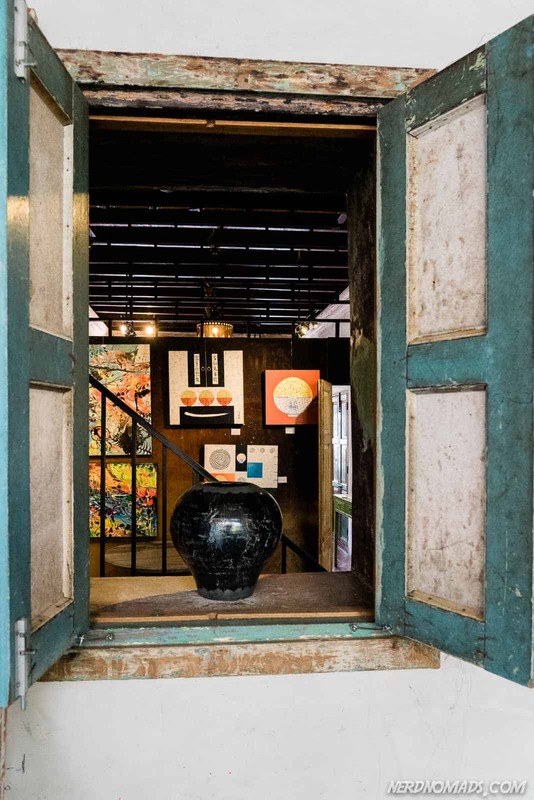 The old shophouses that once housed budget accommodation are now beautifully restored boutique hotels, cafes, museums and art galleries and suitcases are far more prominent than backpacks. Penang is made up of Penang Island as well as part of the mainland. Penang Island has one large city, the capital George Town, and several smaller centers along the coast. 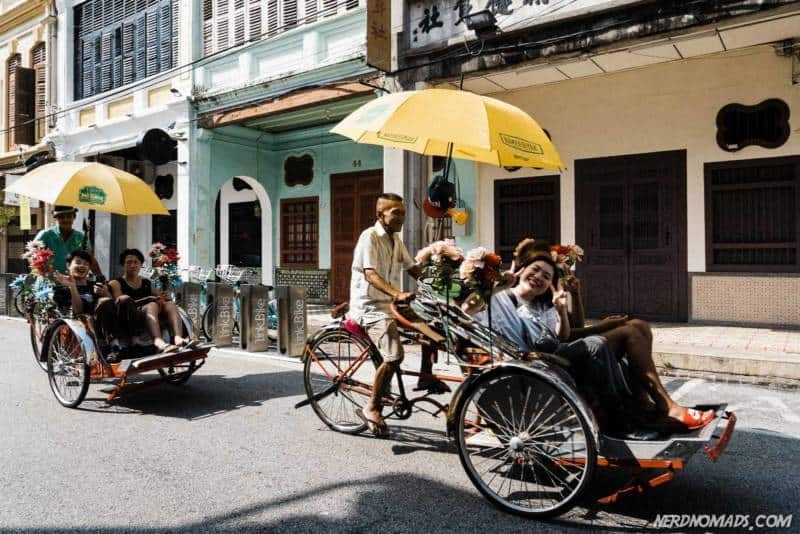 Most visitors who come to Penang choose to stay in or close to the old part of George Town. The unique architecture, sights, and atmosphere of old George Town are what draws in the crowds. While Penang has some lovely sandy beaches, most beach lovers tend to head for nearby Langkawi, where the water is clearer. 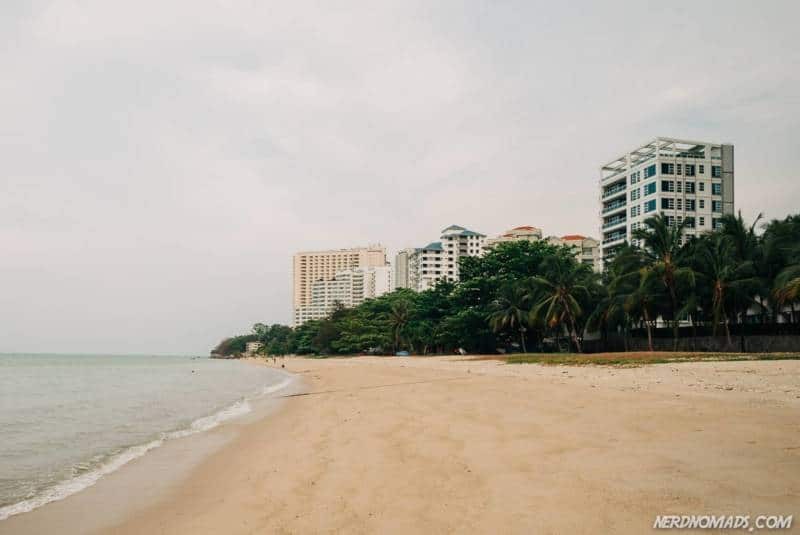 That is not to say that the beaches of Penang are not worth a visit and there are some very nice resorts to stay at along the coast. 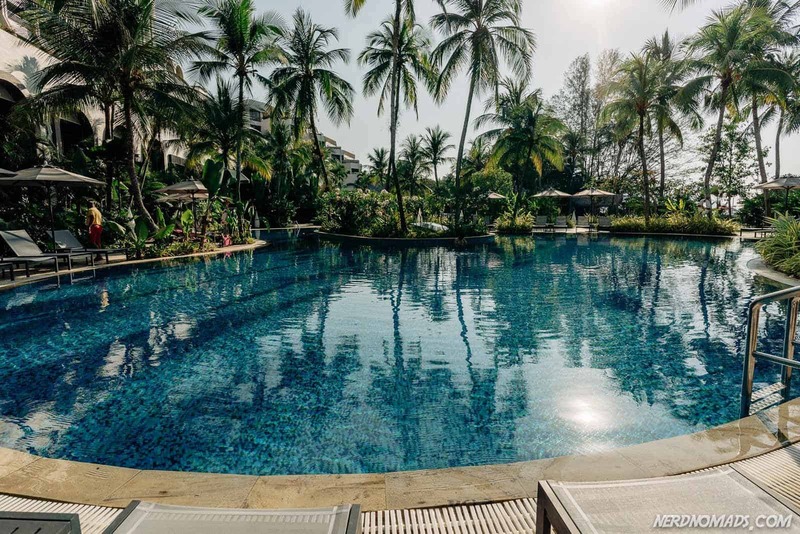 So if you are traveling with kids, want to stay by a beach, or prefer a resort style hotel, then there are some excellent options available – most of them along Penang´s most popular beach area, Batu Ferringhi at the north end of the island. 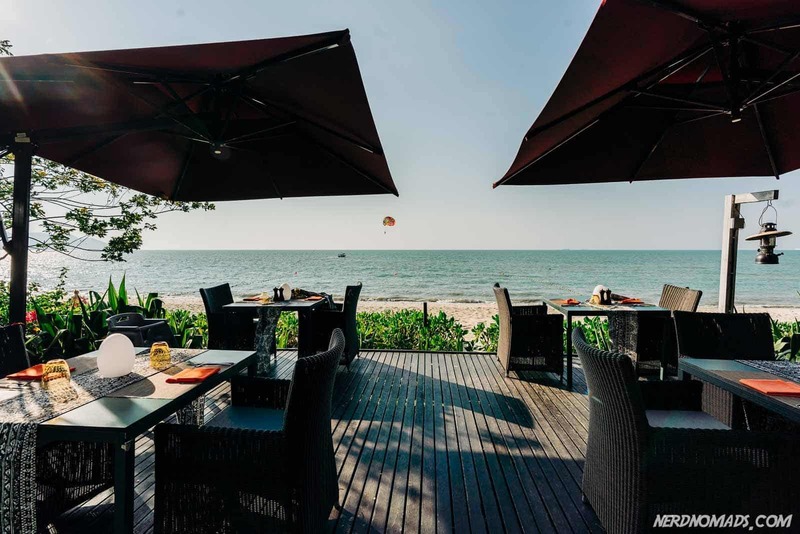 In this guide, we tell you what we think are the best areas to stay in Penang and why. For each area, we have listed our favorite hotels at any budget – Top-End, Mid-Range, and Budget. Researching this Penang guide has been a massive task that started before we even left for Penang, continued through the four weeks we spent there and beyond. 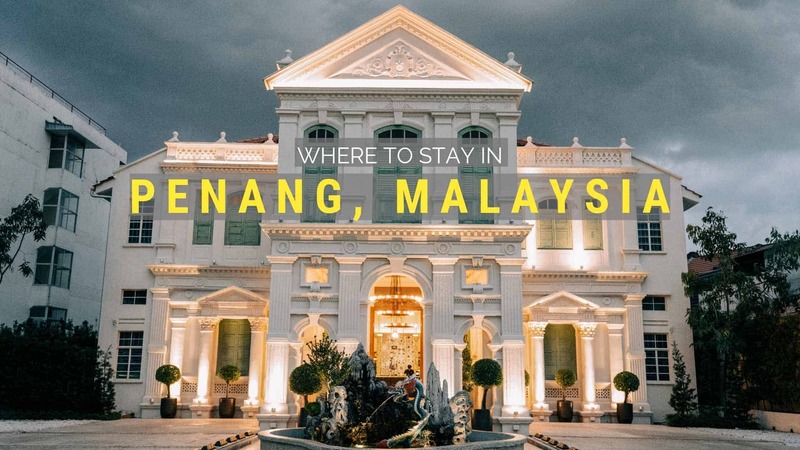 We hope you find this guide helpful in finding the best place to stay in Penang! For most visitors who come to enjoy old George Town, staying inside the towns heritage area is the best option and allows you the easiest access to the sights. If you prefer a beach, then Batu Ferringhi has the best beach accommodations while Tanjung Bungah beach is closer to George Town. Other popular areas to stay in Penang include the nearby modern suburb of Gurney Drive with its enormous shopping malls and legendary seafood hawkers as well as the business district of Bayan Lepas for anyone who needs to stay close to the international airport. George Town is the capital city of Penang in Malaysia. You can not visit Penang without setting your foot in George Town as it is a fantastic city! The mix of old colonial buildings, stunning temples, beautiful and unique street art, fascinating culture and history, a unique blend of different ethnicities descending from Great Britain, Portugal, Middle East, India, and China, and of course the food…ah, the food in Penang is the best in Southeast Asia! Outside the old heritage part of George Town, there are modern skyscrapers and shopping centers, as well as some top-notch restaurants and cafes. One can just not like George Town; it has something for everyone. George Town was declared a Unesco World Heritage Site in 2008 for having a rich history of over 500 years as the central trading hub between East and West. The Unesco award helped kick off its popularity among both Asian and worldwide visitors, and George Town is now one of the biggest tourist attractions in Malaysia. The UNESCO World Heritage Site George Town is divided into two parts: the Core Area and the Buffer Zone where the most important sights are in the core zone. The street Love Lane is the border between these two areas. We have chosen to adhere to the same borders and have in this hotel guide divided our George Town hotel recommendations into the same two areas. However, old George Town is a relatively small town, so the two parts are within easy walking distance of each other. You will hardly see much difference between these two parts of the city; they are both packed with beautiful old heritage buildings, great cafes, restaurants and shops, street markets, and hotels. The map above: Our recommended hotels in George Town, Penang. George Town is divided into two areas (black line) – The Buffer Zone (purple hotels and area) and The Core Area (yellow hotels and area). The Buffer Zone of George Town (on the left side of the black line on the map above, with purple hotels) is the west and southwest side of George Town. The Buffer Zone covers 1,5 square km (150 hectares) in size. Why Stay In The Buffer Zone Of George Town? The Buffer Zone area of George Town contains cozy boutique hotels, cool cafes and restaurants, street markets, and shops. The streets Lebuh Chulia and Love Lane, George Town´s traditional backpacker area, are where the action is with hipster cafes, pubs, bars, and night markets. One of our favorite streets in Buffer Zone is the peaceful and charming Muntri Street which is packed with cozy cafes, and also has some excellent boutique hotels. 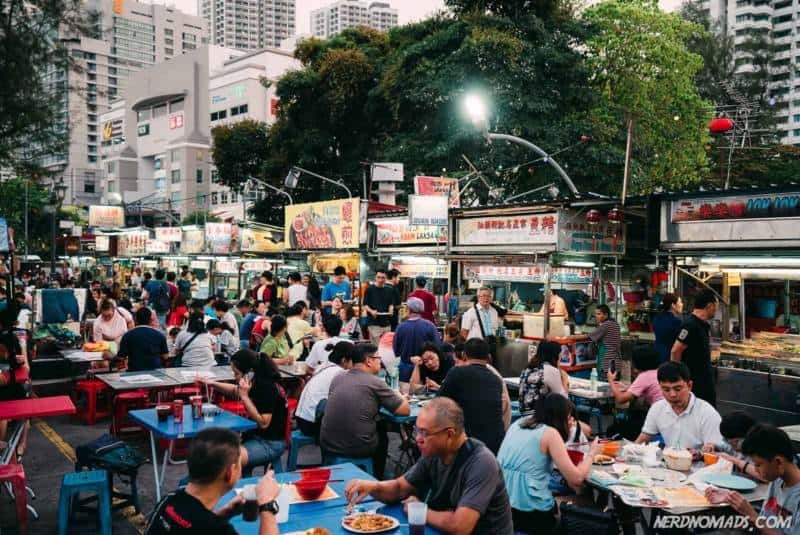 Campbell Street Market, where Lebuh Campbell and Lebuh Carnarvon crosses, becomes a lively street food market in the evenings serving some excellent mouth-watering food at a cheap price. 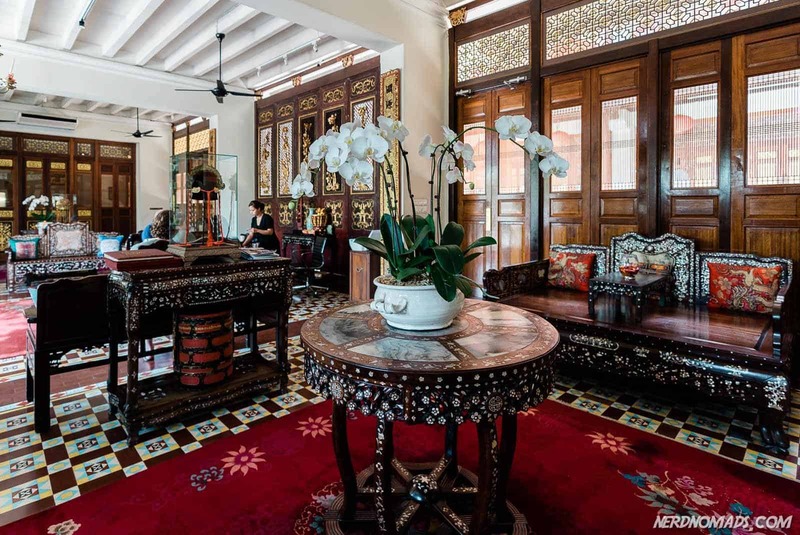 The Buffer Zone includes some of Penang’s most outstanding sites and buildings, like the Cheong Fatt Tze mansion, now Blue Mansion Hotel, which was awarded the UNESCO Most Excellent Heritage Conservation Award in 2000. Another breathtakingly beautiful colonial style building is the Eastern and Oriental Hotel, located right by the seaside. A walk around this area will show you the multicultural and ethnic variety of George Town. 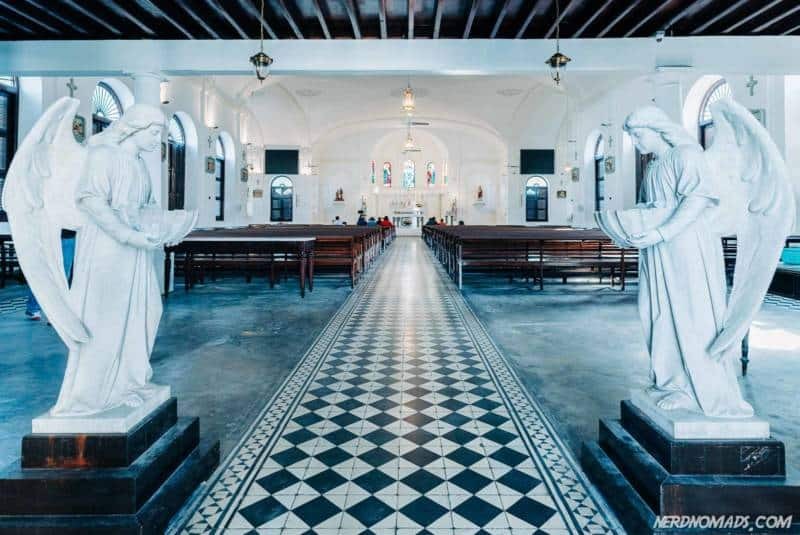 You will see the Protestant Cemetery where the founder of George Town, Francis Light, was buried in 1794, along with several churches, mosques, and temples. The narrow streets of Love Lane, Muntri Street, Stewart Lane, and Leith Street are lovely to walk around, grab a cup of coffee or Teh Tarik (Malaysian tea), have some snacks, and to do some gift shopping. Blue Mansion – Cheong Fatt Tze Mansion – One of the best preserved authentic heritage buildings (now the Blue Mansion Hotel) in George Town. It is stunning! If you are not planning on staying at the Blue Mansion Hotel, you should join one of their guided tours. We did the 15:30 (3:30 pm) guided tour at the hotel, and it was great. There is also an 11:00 (11 am) and 14:00 (2 pm) tour at the hotel. Old Protestant Cemetery – Where Francis Light, the founder of George Town was buried in 1794. He died of Malaria only 54 years old. Church of the Assumption – A beautiful bright white Catholic church. It was built in 1786 when Captain Francis Light, the founder of George Town, first came to Penang. 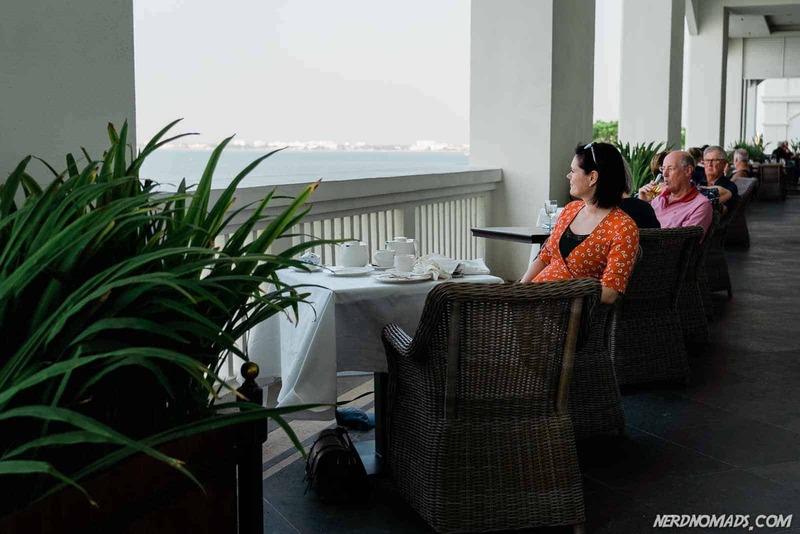 Eastern and Oriental Hotel – A stunning heritage building with a fantastic view of the sea. Fantastic place to watch the sunset and have afternoon tea. The Buffer Zone of George Town is where most of the hotels and hostels are. You will find some of the Penang’s most beautiful hotels here in wonderfully restored old colonial style buildings. Some of them even have a swimming pool. We stayed at this stunning restored colonial mansion, built in 1906, for a week and we loved it! Everything was just perfect! From the spacious, airy, luxurious rooms with private bathrooms, the friendliness, and service by the staff, to the lovely swimming pool. We first stayed at this hotel back in 2005, when it was called The Cathay Hotel and run by some elderly Chinese gentlemen. The layout and outside facade of the building is the same, but the inside is stylishly renovated and looks terrific like taken out of an interior catalog. I particularly love the hallway with its open roof area, a common architectural feature in old George Town houses to let air flow through the house. The staff is always at your service to bring you free cold water at the pool, and serve you whatever you want from the kitchen at any time. The hospitality is truly top-notch and the best we have experienced. The breakfast is not the biggest, but their special bread and jam are delicious, and you get to order your preferred type of eggs. The Edison does not, however, have its own restaurant, but the hotel is surrounded by excellent restaurants and street food so you will not go hungry. Just on the opposite side of the road from the entrance of The Edison is the Red Garden, a great hawker center serving excellent food. 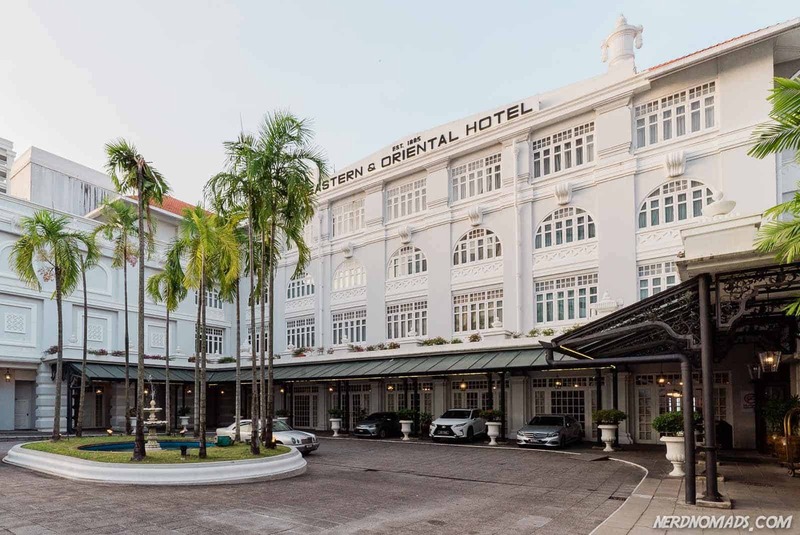 You can´t go wrong by booking The Edison as your hotel in Penang! 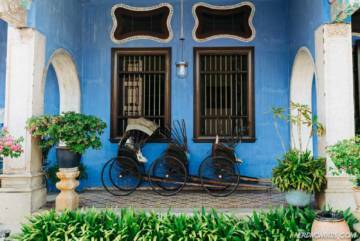 Blue Mansion is Penang’s most authentic heritage hotel, and it oozes that 19th-century colonial luxury vibe. The building is stunning, built in 1880 and painted in blue therefore its name. This type of blueish indigo-based limewash was common in George Town around the time when Blue Mansion was built. The building has been through several restorations since the 1990s. It was once the home of a successful merchant-trader from China, Cheon Fatt Tze, who lived here with his wife and son. If you don´t plan on staying here, you should at least join one of the three tours that are arranged at the hotel every day, at 11:00 (11 am), 14:00 (2 pm), and 15:30 (3:30 pm). The guide will show you around the stunning hotel and tell you the rich and fascinating story about the original owner of the Blue Mansion. We did the afternoon tour, and it was great! The 18 comfortable guest rooms are elegant and stylish with high ceilings, colorful art stained glass, and beautiful terracotta tile floors. The rooms are decorated in a colonial kind of style with antic furniture and are the perfect mix of East and West. The rooms all face an airy courtyard and there is a swimming pool. The Blue Mansion also has an excellent restaurant. We went there for lunch and they have a great 3-course lunch-set-menu which is a good value (only western food though). If you want to stay in style and feel like you are back in the colony era, but still want the comfort of modern time, then this is it. This fantastic bright white colonial style hotel has probably the most stunning location in George Town, right by the sea. The building dates back to 1885. The swimming pool is spectacular, right by the sea with stunning sea views surrounded by palm trees and plenty of lovely chairs and beds for relaxing. We loved watching the sunset from the swimming pool. The hotel has two wings. The Heritage Wing, which has a colonial-era vibe to it with its antique furniture and decor yet with a modern twist. The more modern Victory Annexe Wing is also very nice. The rooms with balcony and sea view are well worth the extra money. Update: The Heritage Wing is closed for renovation for nine months from 1st of March 2019. It will reopen around the 1st of December, bright, new, and shiny! Eastern & Oriental Hotel has everything one would expect from a top end hotel, spacious rooms with big comfortable bathrooms, in-house restaurants, a bar, excellent wifi, complimentary minibar, and 24-hours butler service. The hotel has impressively six dining options! The restaurant 1885 serves traditional English afternoon tea, and the Sarkies Corner offers a range of international and local dishes. Update: Since the restaurant 1885 is in the heritage wing is closed for renovation until December 2019; afternoon tea is served in the restaurant on the 6th floor of the Victory Annexe with a fantastic sea view and a lovely terrace. We joined the afternoon tea there, and it was awesome, both the food, tea, and views. We were blown away by our suite and loved our balcony and sea view. The hotel has such a great location, right in the middle of George Town with all its sights and restaurants, and yet by the sea. It was great to come back to our room in the evenings after a long day sightseeing and be able to relax and wind down and enjoy the lovely sea breeze on our balcony. A perfect combination! If you want to stay in style, but at the same time have access to a lovely swimming pool right by the sea, the Eastern & Oriental hotel is the perfect match for you. 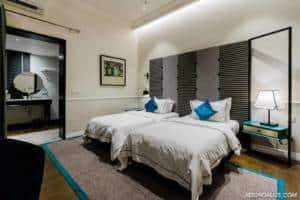 With only 12 rooms, Campbell House is a lovely boutique hotel in a beautifully restored old Chinese shophouse dating back to 1903. The hotel ooze of charming colonial-era style mixed with modern amenities where each room has a unique and different layout and style. The service is excellent, with small complimentary desserts and cakes served to your room in the afternoon and evenings. There is an Italian restaurant on the first floor of the hotel. We loved their Italian pizzas. We found the wifi not the greatest, however, as it was a bit slow and unstable. But data sim cards are cheap in Malaysia, and I recommend that you buy a sim card anyhow so that you can use Google Maps and other apps when walking around the city. A beautiful heritage hotel on Muntri road, right in the middle of everything George Town has to offer. The rooms are spacious and airy, and there is a mid-sized rooftop swimming pool with a shaded seating area. A perfect place to cool down and enjoy a drink after a day of sightseeing in the heat. The rooms have an elegant shabby chic decor which I love. There is a nice long side wall sofa with beautiful cushions perfect for chilling out reading a book. The rooms downstairs have garden access, while the upstairs once are located on the same floor as the swimming pool and breakfast area. The building is well maintained, and the rooms are sparkling clean. We found the breakfast Ok, but nothing to brag about, a pretty plain continental breakfast. So we mostly skipped the hotel breakfast and ate at one of the many cozy cafes in Muntri Street where the hotel is located. Try the Passion Heart cafe just down the road, it became our favorite for breakfast and is famous for its fantastic cakes! I loved the Jack fruit cake. 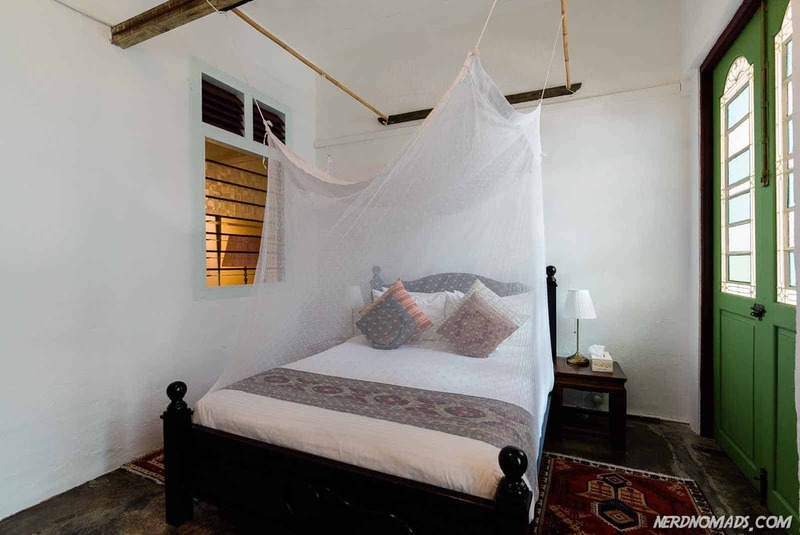 The staff at Muntri Grove sprayed for mosquitoes and turned down the bed and put the mossie net around the bed in our room every night. I had Dengue fever last year and try my best to avoid getting mosquito bites. It was nice to see how well they took such care of us. Muntri Grove Hotel sisters hotel, the Muntri Mews, lies a few blocks down the quiet street Muntri Road. Muntri Mews is a luxury boutique hotel located in a beautifully restored two-story colonial building in the heart of George Town. Muntri Mews serves excellent breakfast, both local and Western-style, and has a very cozy and charming cafe downstairs which is also popular with outside guests. We had lunch there several times and it was delicious. It is a great place to try local special Penang dishes. Some evenings there are live music performances in the restaurant. The rooms are spacious with a hip and lovely design. They are all different both in layout and design, but they all have a comfortable seating area, TVs with cable tv, modern bathroom, great aircon, and firm and comfortable beds. Muntri Mews does not have a swimming pool, which we missed. 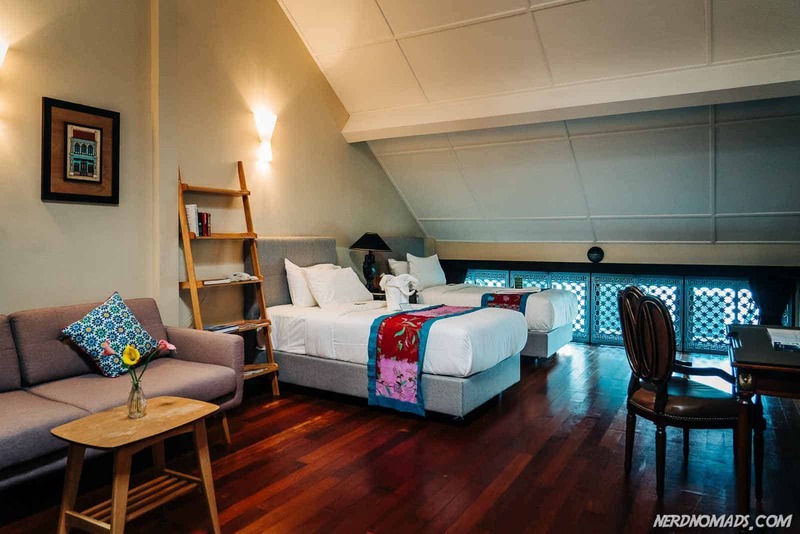 The cozy Areca Heritage Hotel has 48 spacious rooms located across twelve old Chinese shophouses in a private enclave along Khoo Sian Ewe Road. The fresh rooms are all beautifully decorated and are different in both size and layout. You can choose between spacious family suites, cozy garden rooms, or luxurious heritage suites. All rooms have modern and comfortable furniture and amenities. An extra welcoming bonus for us was the complimentary coffee, tea, ice cream, cakes, and biscuits served daily at the hotel cafe from 14 (2 pm) to 16 (4 pm). Loved it! 🙂 Good breakfast too. The hotel has a restaurant, but there are lots of restaurant and street food options in the area near the hotel. The hotel does not have a swimming pool. By staying at the Areca Hotel, you will be within walking distance to everything George Town has to offer of sights and attractions. The plain concrete building is not much to look at, but Chulia Mansion makes up for it with its super central location and value for money. The rooms are squeaky clean, with comfortable beds and private bathrooms. All rooms also have a. Satellite TV and free and surprisingly fast WiFi. The rooftop bar and Jacuzzi is a lovely place to relax in the evenings, and the daily complimentary ice cream and glass of red wine is a treat. Breakfast buffet has a good selection for both Asian and western visitors, and there are lots of restaurants nearby. 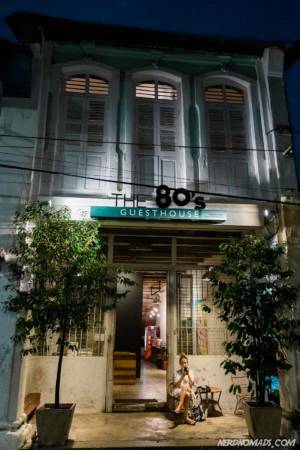 The 80s Guesthouse is an excellent budget hostel located on the quiet end of Love Lane just a one minute walk away from the popular restaurants and bars. 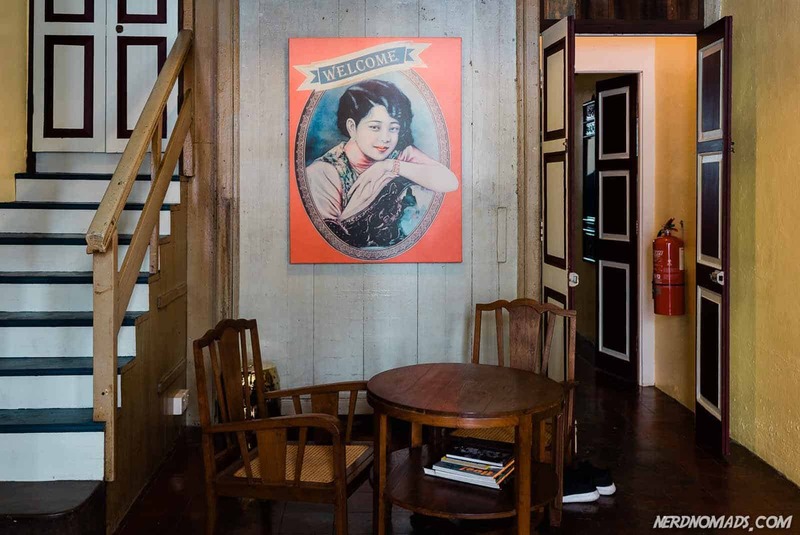 Its shabby chic rustic style with 80s inspired decor and posters on the walls gives the hostel a unique vintage vibe that mixes well with the old restored shophouse. The rooms and dorms are basic but spotlessly clean and comfortable with air con and free Wifi. There are washing machines available, and a small complimentary breakfast is served daily. The Core Area of George Town is about 1 square km (109 hectares) in size and contains more than 1700 historic buildings, many of which are protected by law. The Core Area includes the part of George Town that faces the sea and the George Town Pier. Why Stay In The Core Area Of George Town? The Core Area of George is where much of the action is, both regarding sightseeing and street art, but also restaurants, markets, cafes, and nightlife. The shopping is also excellent in this area, and you will find everything from upscale designer labels to native handicraft and hipster vintage stuff. 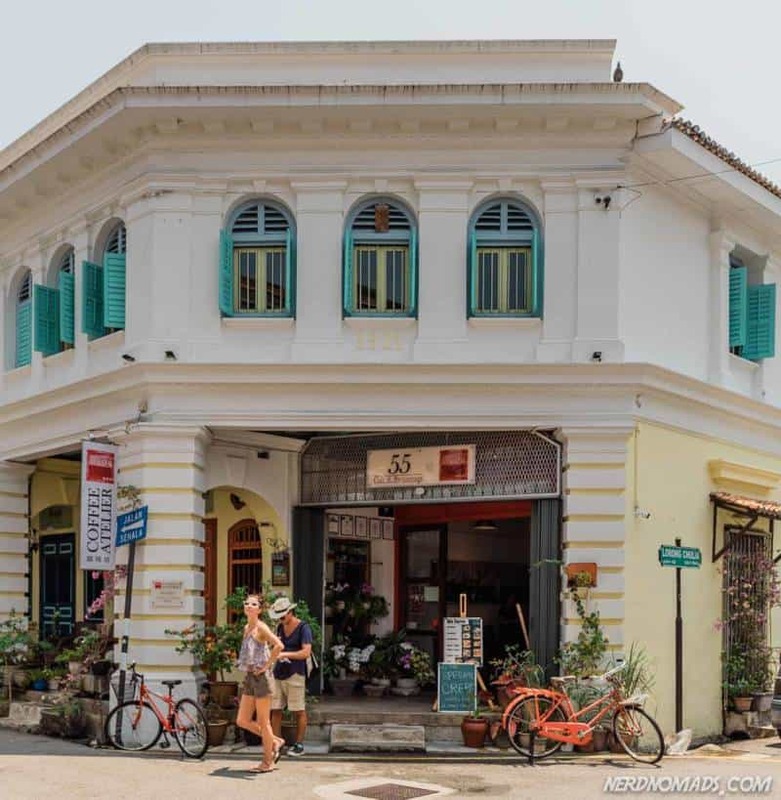 If you want to be in the middle of everything with short and easy access to all the food and ancient colonial and shophouse buildings of which George Town is famous for, then you should stay in the Core Area. 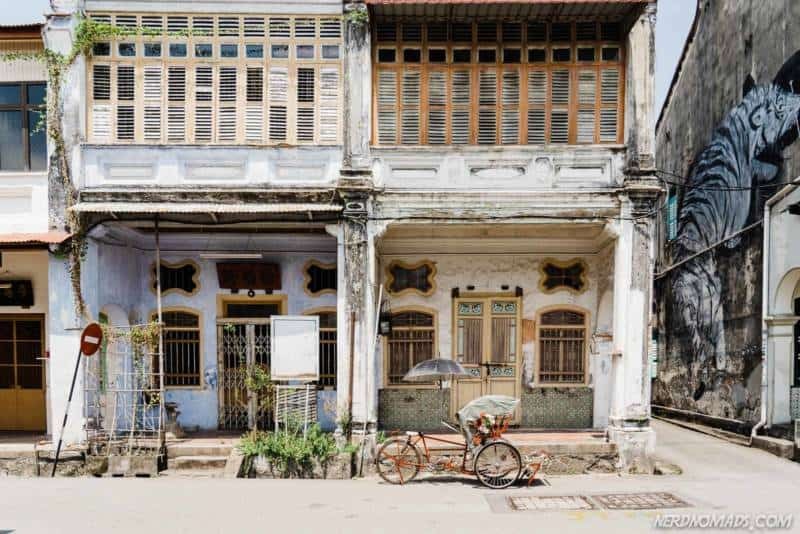 This area of George Town has one of the largest collections of 19th and 20th-century buildings in the whole of Southeast Asia, and many of them are now protected by law and beautifully renovated back to their original state and glory. This is the perfect place to wander around through the narrow lanes and get a little “lost” among the beautiful buildings and unique street art that is literally all around you. The Core Area has the sea and the port which is a lovely area to go for a stroll and to enjoy the sunset and the sea view. Here you will also find the only green area of George Town, the Esplanade Park. The green lawn is a nice place to lay down for a little siesta or to bring something to eat and drink and have a little picknick. There is also a nice food court here. Try the coconut shakes, they are amazing! Sri Mariamman Temple – A beautiful and bright colored Hindu Temple. George Town´s oldest Hindu temple, built in 1883. 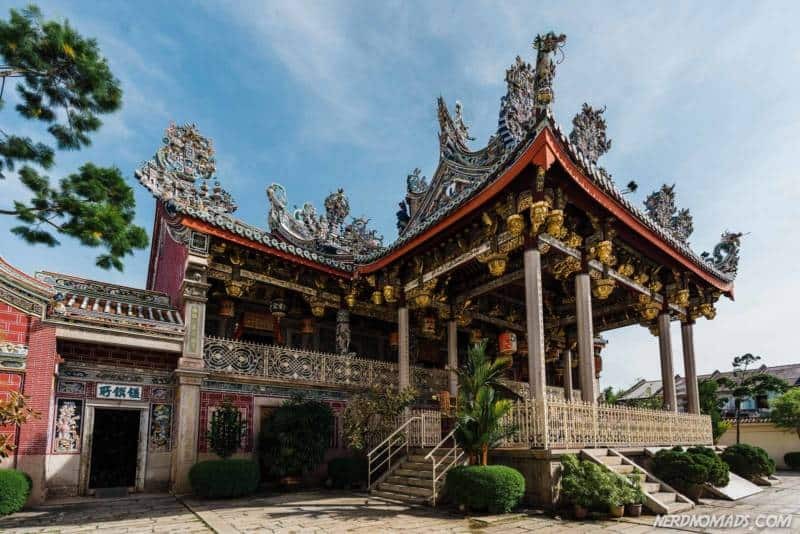 Seh Tek Tong Cheah Kongsi Temple – Is the first of Penang’s five great Hokkien clan houses. The temple is beautiful! Khoo Kongsi Temple – Built in 1906, and is the grandest clan temple in Malaysia. Kuan Yin Teng Temple – A photogenic Buddhist temple dedicated to Kuan Yin, the goddess of mercy, good fortune, peace, and fertility. 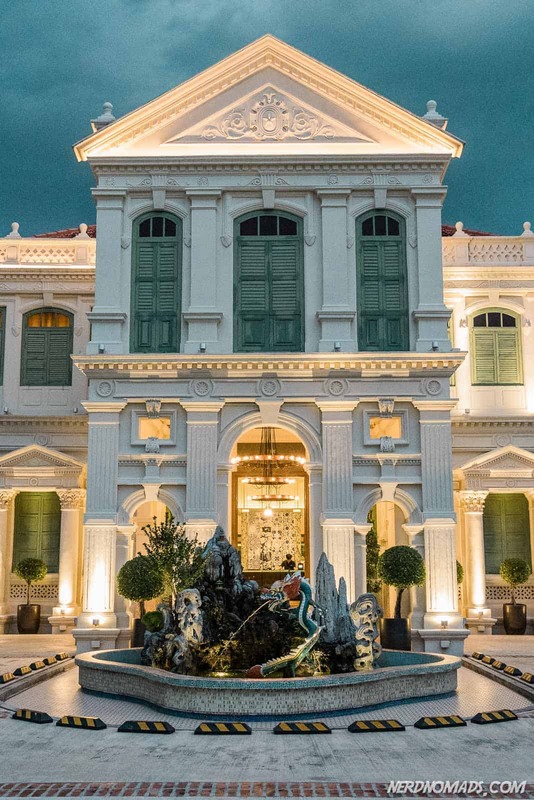 Pinang Peranakan Mansion Museum – This is the most stunningly restored residence in George Town. All the doors, walls, and archways are elaborately carved and painted in gold leaf. The grand wooden furniture has a mother of pearl decorations, and the house is filled with stunning antiques. 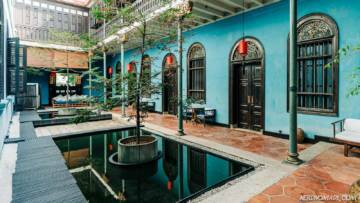 It was the home of one of the wealthiest Peranakan of the era, clan leader and merchant Chung Keng Quee, in the 19th century. Chew Jetty – Down by the harbor, you find the largest and most intact area of the clan jetties. 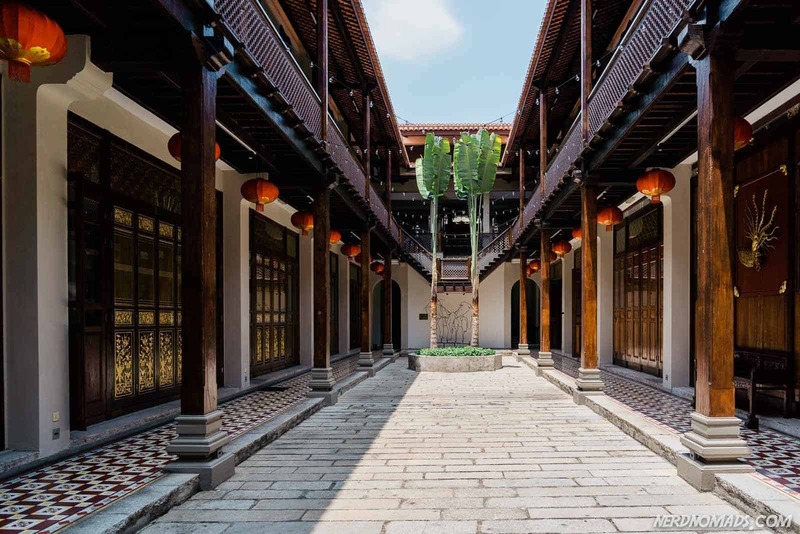 Seventy-five houses where people live, as well as several Chinese temples, cafes, and businesses, are connected by wooden walkways. It is a nice place to go for a stroll and look at fishing boats and families cooking their dinner, and kids playing around. 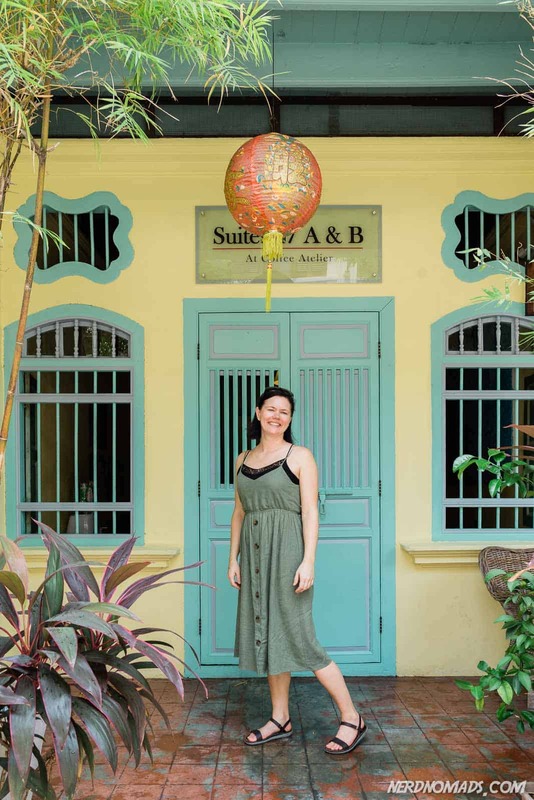 The Core Area of George Town has a wide selection of accommodation options at all price levels, from chic backpacker hostels and bed&breakfasts to luxurious heritage boutique hotels. 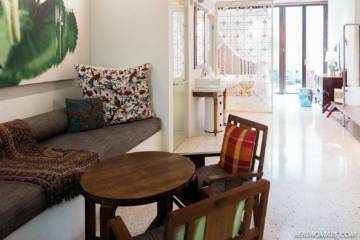 If you are looking for a truly unique place to stay in Penang then the Seven Terraces is hard to beat. 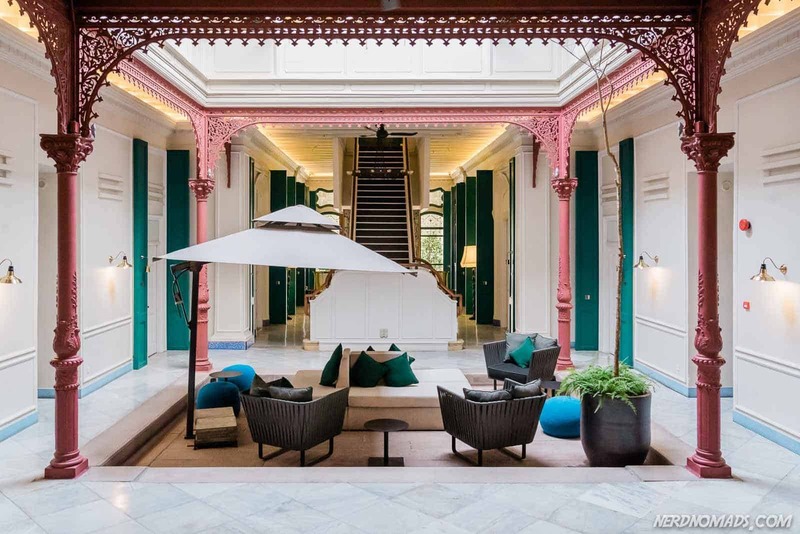 It is one of the most beautiful boutique hotels in the whole of Malaysia and is set in an exquisitely renovated row of seven Anglo Chinese late 19th-century terrace houses. From the moment you step inside the lobby, richly decorated with Chinese antiques, it’s like being transported to a long lost era. The sixteen suites vary somewhat in size and layout, but they all combine their unique heritage with modern comforts and face an airy interior courtyard beautifully decorated with flowers and lit by lanterns at night. While the rooms are very comfortable, be aware that the bedrooms are located on the second floor so be prepared to climb some stairs. Complimentary afternoon tea is served daily and the in house restaurant, Kebaya, is widely regarded as one of the finest in the city. We loved the swimming pool as well as a relaxing shaded seating area on the ground floor. The location is fantastic with most sights within easy walking distance. 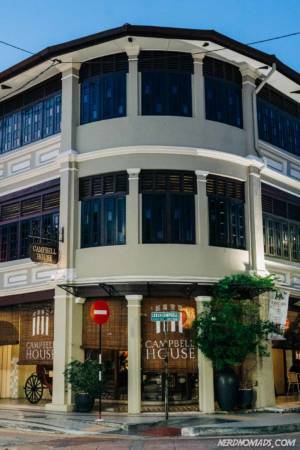 A small boutique hotel/ guesthouse located in a row of five restored shophouses centrally situated in one of the most quaint and charming streets in George Town, just opposite the street from Seven Terraces. Besides the hotel, the building house a restaurant, a coffee museum, as well as an art gallery. The ground floor suites all have their private courtyards and a unique and very cool “outdoor” bathroom. All suites are large with a separate seating area, and modern comforts such as air-con, flat-screen TV, tea and coffee maker and mini-fridge. There is a party hostel across the street, but the suites are well set back and soundproof. We loved that each room has its own front door, and you don´t have to go through reception or lobby. It felt like we had our own apartment. The staff is extremely friendly and always available to help or have a little chat. The breakfast is excellent and plentiful, and we fell madly in love with their special crepes at the cafe. Ren I Tang is a fantastic little Inn. 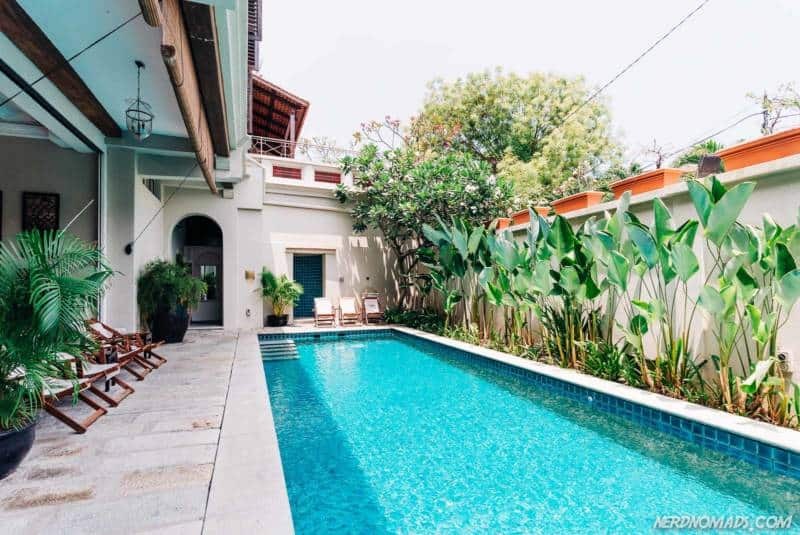 It is perfect if you are looking for a comfortable stay in a beautifully renovated heritage building smack in the middle of the busy, colorful and lively Little India district. The rooms are cozy, clean and comfortable and perfectly combine old world ambiance with modern amenities. Be prepared though that the stairs in this heritage building are a little steep. The staff went out of their way to make sure we have an enjoyable stay. There is a sitting area downstairs as well as a small bistro perfect for watching life on the streets. If you are coming or leaving George Town by ferry or bus, then Ren I Tang is very conveniently located, just a few minutes away. Staying at You Le Yuen is almost like living with family. That is if your family lived in a beautiful two-story colonial pre-war shop-house filled with antiques. 🙂 The cozy homely feel and the warm service makes this small place feel more like your home than a hotel. We had a chat with the owner of the hotel, and she told us the interesting story of the house. The four rooms are all unique and combine classic style with modern comforts such as flat screen TV, Wi-fi and aircon. The larger rooms have balconies that open up to the airy indoor courtyard. Breakfast is tasty, but serving sizes may be a little on the small side for some. The staff is lovely and can arrange tours around George Town and to other parts of the island for you. You Le Yuen is well located at the quiet end of Love Lane just a few minutes walk from the restaurants, and is an excellent base from which to explore George Town on foot. Spices Hotel blends perfectly the historical with the modern. With a relaxing Arabian influenced decor and a cozy vibe, this small hotel offers a lot of value for the money. The rooms are clean and comfortable and come with wi-fi, air con, and a flat-screen TV. Rooms vary a bit in size, so it may be worth upgrading to a superior room if you are traveling with a lot of luggage. The common area is a wonderful place to read and wind down after a day of exploring. 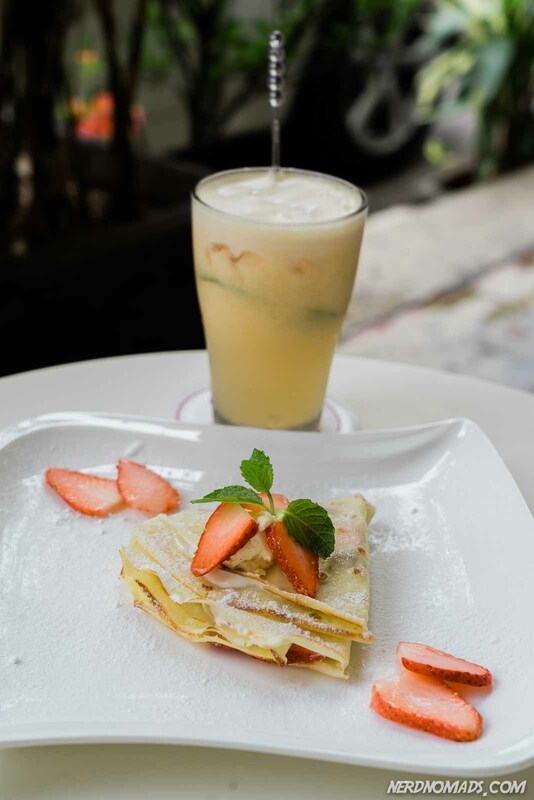 Located on a quiet side street, close (but not too close) to the popular tourist area along Armenian Street. Be aware that unless you sleep like an elephant, you will hear the morning prayer from the nearby mosque; it’s just a part of the character of this area. St Hostel George Town offers both dorm and private rooms in a great location. Rooms and dorms are basic but comfortable and clean with aircon and free Wi-fi, and the bathrooms and showers are modern, spotless, and fresh. Private rooms have a flat-screen TV, and a few have private bathrooms. There is free tea, coffee, and biscuits available in the shared dining area. The host, Han, is always accommodating and very friendly. Batu Ferringhi is the most popular beach area in Penang. 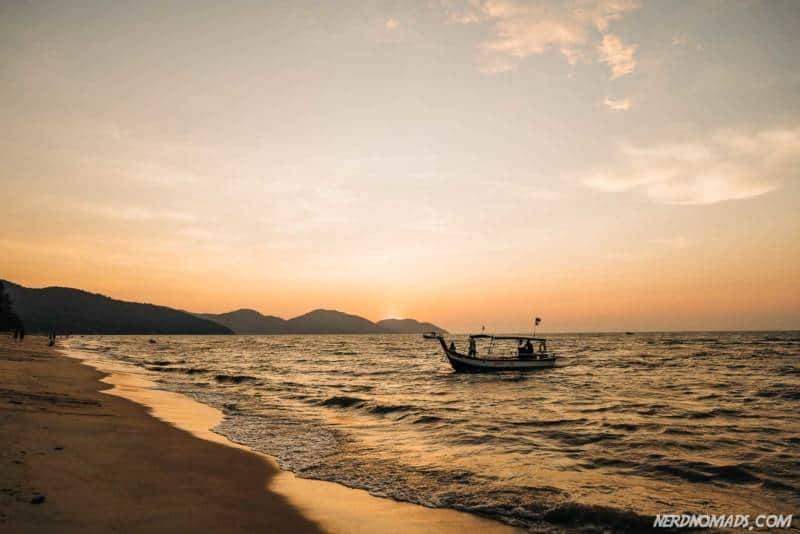 It lies at the northern end of the Penang Island and covers roughly 4km of the coastline. It has a long history dating back to 1592 when James Lancaster, a British explorer came ashore here and in doing so unwittingly gave the name to the area. Batu Ferringhi means the place that foreigners came ashore. 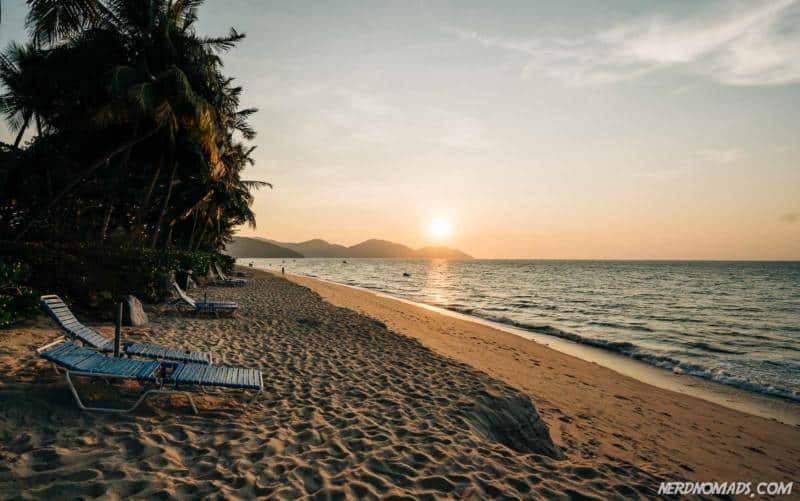 In the 80s Batu Ferringhi Beach became a popular holiday destination, and today large international resorts line the beautiful long white sandy beach. Jet ski and other watersport activities are popular, and rentals are readily available. Why Stay In Batu Ferringhi? Stay in Batu Ferringhi if you are looking for a high-end resort style hotel with pools, tennis courts, watersports and activities for kids. You won’t find these sorts of hotels in George Town. 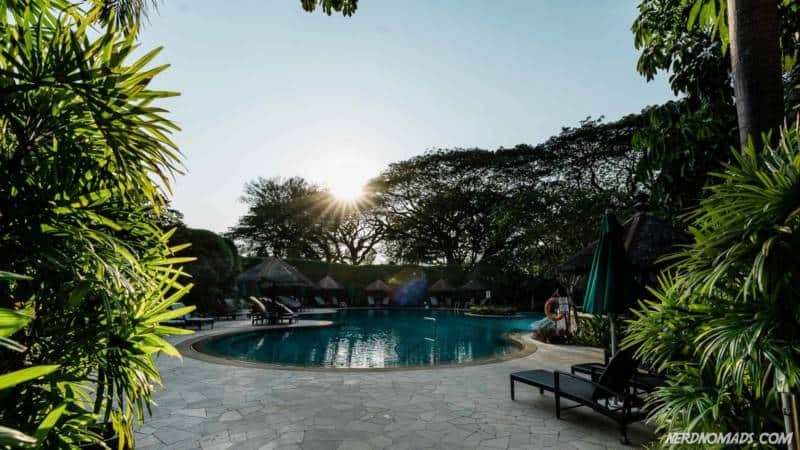 There are quite a few excellent hotels available in Batu Ferringhi at very fair prices, much less than these high-end international resorts cost elsewhere in Southeast Asia. You are also close enough to George Town to take day trips there, and it is a great base from which to explore attractions on the north end of the island. It is also a good home base for families traveling with kids who will appreciate the facilities that these hotels have for children. If you are a budget traveler and the resorts are out of your budget yet you are looking for some beach time. Then I would recommend staying in George Town and take a day trip to Batu Ferringhi or even better the more secluded beaches inside the nearby Penang national park. There are cheap local buses going from George Town to Batu Ferringhi quite often. Batu Ferringhi is famous for its night market that pops up along Batu Ferringhi Road from 19:00/ 7 p.m until around midnight. 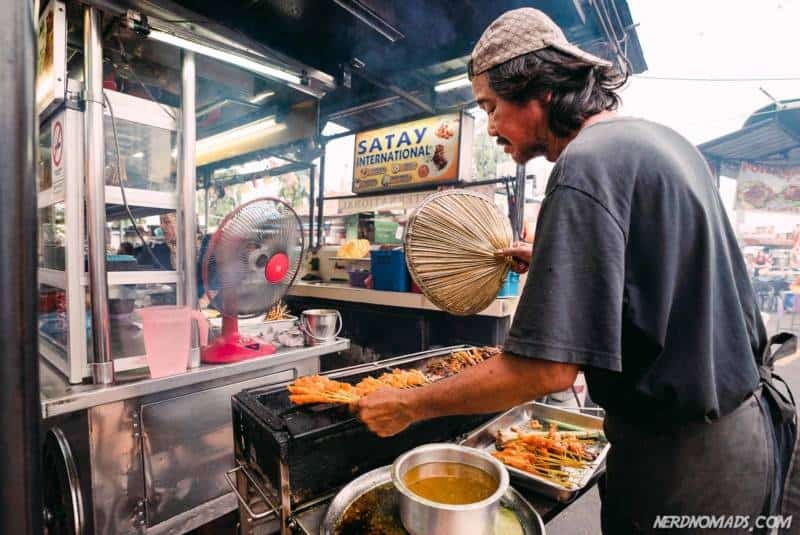 The long line of stalls sells everything from knock-off handbags to cheap t-shirts, sunglasses, and souvenirs, while street food hawker centers cook up tasty Penang dishes. If you are staying in the area, it is worth a visit, but there are better markets in Georgetown. Etopia Butterfly Farm – A fantastic green oasis with over 15 000 free-flying butterflies. We had a great time! Spice Garden – A very nice garden with all the spices you can imagine. You will get an audio guide included in the ticket price that explains the herbs and spices as you walk around the garden area. Also has a nice restaurant with delicious food. Fruit Farm – A garden packed with tropical fruit trees of all kinds. Depending on the season, not all trees will have fruits. Batik Factory – Learn how they make the famous Malaysian batik. If you are lucky, you can make your own batik clothes. Also has a nice shop selling batik clothes and souvenirs. Hard Rock Cafe – A classic Hard Rock Cafe restaurant selling burgers, steaks, and other western food. Also has the traditional Hard Rock Cafe shop selling t-shirts and Hard Rock merchandise. Also has a big resort hotel. Escape Theme Park – The only theme park in Penang. A fun place to go crazy. Lots of different activities, slides, rides, and games. Penang National Park – A beautiful national park with two peaceful and stunning white beaches, turtle beach and monkey beach. We hiked to the beaches through the jungle of the national park, but you can also take a boat. Unfortunately, as is the case with most of Penang’s beaches the water is no longer as clear as it once was which in turn has caused somewhat of a jellyfish problem. Depending on the currents and time of year swimming in the ocean may not be recommended. 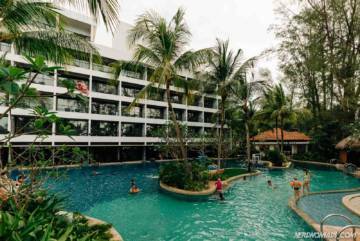 The below hotels all lie along Batu Ferringhi Beach with direct access to the beach and within easy walking distance of the night market and plenty of restaurants. 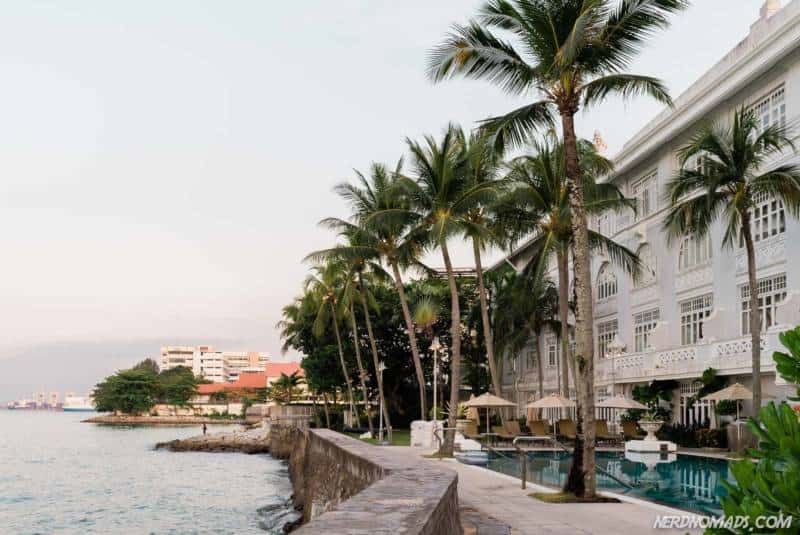 Ask any local in Penang what is the best hotel in Batu Ferringhi and nine times out of ten they will say the Shangri La. One of the first hotels to stake its claim in Batu Ferringhi. Its vast grounds occupies the best location at the eastern end of the beach just beneath Emerald Hill. Nestled beneath a canopy of large century-old trees the hotel and its beautiful well-maintained garden is a relaxing oasis. The rooms are large and while not the most modern in style they have been well maintained with super comfortable beds and spectacular views overlooking the seaside. There are two large pools (one for the exclusive use of those staying in the hotel´s Rasa wing), a tennis court, a spa, as well as a well-equipped gym. Breakfast is excellent with plenty of options, and every afternoon there is a complimentary tea service. The hotel provides a free shuttle service to George Town, which is super convenient. Shangri La is a fantastic classic hotel if you are looking for a relaxing environment. We really enjoyed having a sunset drink or two at the nice hotel bar located right by the beach with stunning sea view. Parkroyal has had a complete facelift, and the newly (2018) refurbished hotel is now looking better than ever. 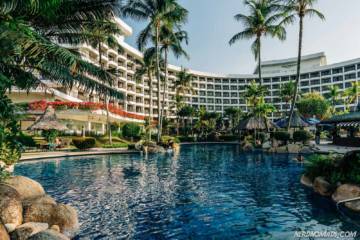 Add the friendly and attentive service that starts the moment you set foot inside and the Parkroyal is currently the hotel to beat in Batu Ferringhi. Standard rooms are not very large, but they are fresh and well designed with every modern comfort. Deluxe rooms are larger, and the sea facing rooms have a balcony with a spectacular view of the sea. There are two large pools, including a kids pool, set in a beautiful garden as well as an excellent fitness center. Whereas the original Shangri La has an adult feel, this sister property next door is perfect if you are a family traveling with kids. A range of activities such as family cooking classes is included in the price of the room. The hotel has a Cool Zone Kids Club for kids between 5 and 12 years old, a kids pool, and a playground. There is also a large pool, fitness center, and a tennis court. Some of the rooms, while still comfortable, are starting to look a little dated and are currently being refurbished. Hard Rock Hotels is the newest resort in Batu Ferringhi and it seems to be the most popular, at least when we stayed there. The Hard Rock brand is very hot in SE-Asia, and it can get packed here on the weekends and public holidays. The hotel has a family-friendly vibe with a huge pool and a kids play area with some very popular water slides. The rooms are fresh and modern with the most up to date entertainment system I have ever seen in a hotel room with a huge flat screen TV, surround sound and free movies on demand. 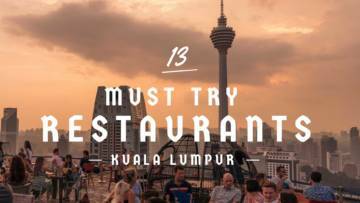 There are no less than four in-house restaurants including a pizzeria and of course the legendary Hard Rock Cafe and shop itself. Gurney Drive is a seaside promenade ten minutes drive along the coast from the old part of George Town. It was once a sandy beach front area with crystal clear water, seaside bungalows, and legendary seafood hawkers. A combination of sand erosion and a few unfortunate development decision in the 80s means that those days along with the beach are both long gone. While there are still some colonial mansions tucked away among the high-rise buildings, today Gurney Drive is a popular upscale shopping and business suburb. Gurney Drive is the modern part of George Town, far from the old shophouses and narrow lanes of the old town. It has several posh shopping malls, hip coffee bars, and some of George Townś largest and best modern hotels. And yet, there are still some signs of the past; The famous Gurney Drive Hawker center is stubbornly refusing to give way to modern development despite having already been relocated a couple of times. A new seaside park is currently under construction just outside Gurney Drive. The park will contain a human-made beach, a water garden and a food and dining area where the Gurney Drive Hawker Center will have its new home. It will be called Gurney Warf and is expected to be ready by 2020. Can´t wait to see it finished, it looks promising. 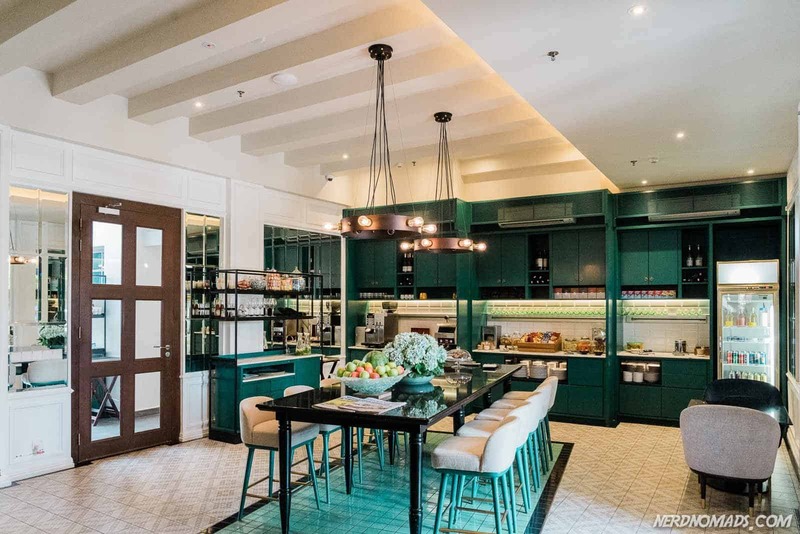 Gurney Drive is a great place to stay if you prefer having easy access to things like modern shopping malls, cinemas, and supermarkets while still being just a quick taxi ride away from the old part of George Town with all the historic sights. Gurney Drive is also an attractive area, albeit somewhat expensive, for anyone wishing to stay long term in George Town. The area is well connected by public transportation with bus number 101. The Georgetown hop-on-hop-off bus also has a stop here. There are two huge modern shopping malls here, Gurney Plaza Mall and Gurney Paragon. 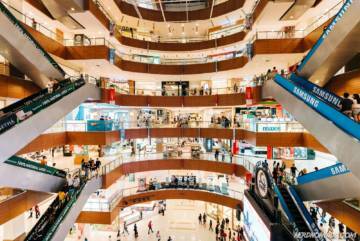 Gurney Plaza is the largest while Paragon offers slightly more upscale shopping options. Both are packed with international brand shops, cafes, and restaurants. Gurney Plaza also has a multi-screen cinema showing international films in English. Outside Gurney Plaza, on the seaside to the left, is the current location of the most famous hawker food center in Penang – Gurney Drive Hawker Center. Its fame has made it a popular attraction for foreign visitors who flock here after sunset. 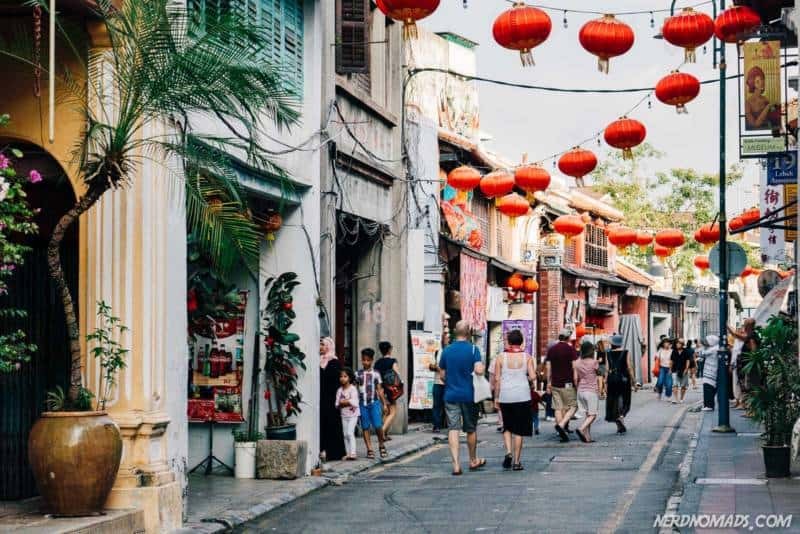 It may not entirely be what it once was, and the prices have become a little inflated, but it is still a cool place to slow down on some Penang treats while enjoying the sea breeze. Wat Chaiya Mangkalaram temple – The largest Thai temple in Penang. It is beautifully decorated with gold, Buddhas, and ornaments. Dharmikaram Temple – This Burmese temple is located right across the street from the Thai temple, and worth a visit if you are in the neighborhood. 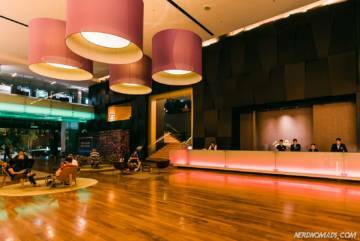 G Hotel Gurney is a large, contemporary and trendy hotel. It is situated in between the Gurney Plaza and the Gurney Paragon shopping malls and within easy walking distance of both. The rooms are spacious and decorated in a modern style with super comfortable beds, a seating area with a sofa, work desk, and a large flat screen TV. The free non-alcoholic mini-bar restocked daily is a nice touch, and breakfast is excellent. The hotel has a well sized outdoor swimming pool as well as a well-equipped fitness center open 24 hours. The lobby is airy and gigantic with seating groups and a bar. There is often live music here. This sister hotel of the G Hotel Gurney is located just a few minutes walk away. They share the same modern style aesthetics, friendly service, and large and comfortable rooms. There is a rooftop swimming pool overlooking the city as well as a really cool rooftop bar. This is the perfect place for you to wind down after a long day exploring Penang. If you would like to stay in the Gurney Drive area but prefer smaller boutique hotels, then Palanquinn Heritage Suites is a great option. 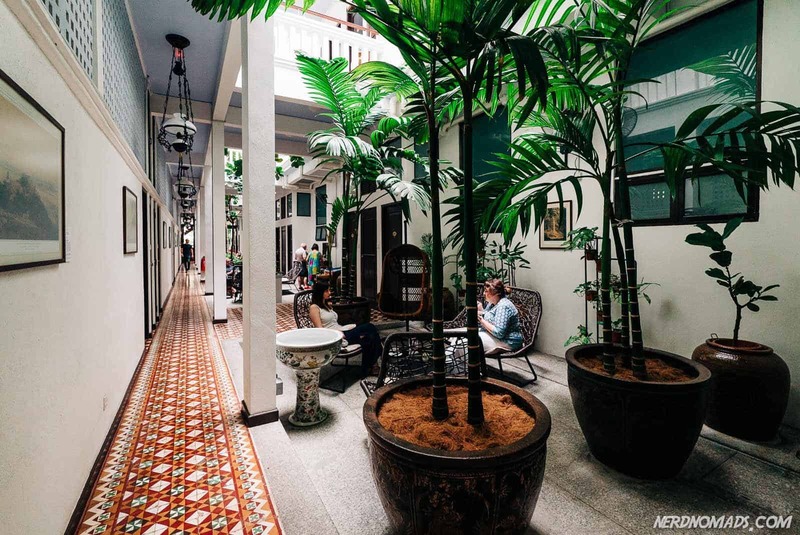 A pre-war townhouse turned into a boutique hotel in old Peranakan style. 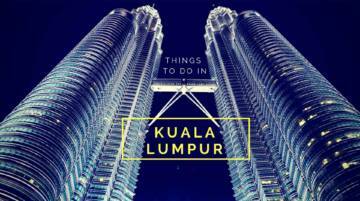 It’s about 15 minutes walk away from Gurney Plaza shopping mall. 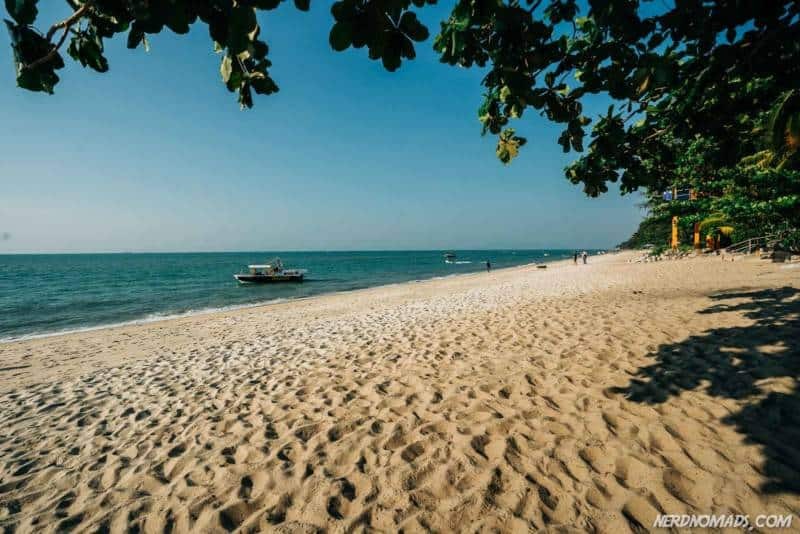 Tanjung Bungah was the first beach in Penang to be developed into a holiday destination. It lies between Gurney Drive and Batu Ferringhi. Tanjung Bungah Beach became popular with visitors in the 70s, and the resorts here are generally older than what you find at Batu Ferringhi Beach. Many of the hotels here are starting to look their age, and they are not as nice and modern as the resorts lining Batu Ferringhi Beach. But the hotels in Tanjung Bunga Beach are less expensive than the ones at Batu Ferringhi Beach. As for Tanjung Bunga Beach itself, it is a wide stretch of white sand perfect for a relaxing day. However, it shares the same problem as most of Penang´s beaches, namely that the water isn´t the clearest and that jellyfish may be a problem. It is the closest proper beach to George Town. 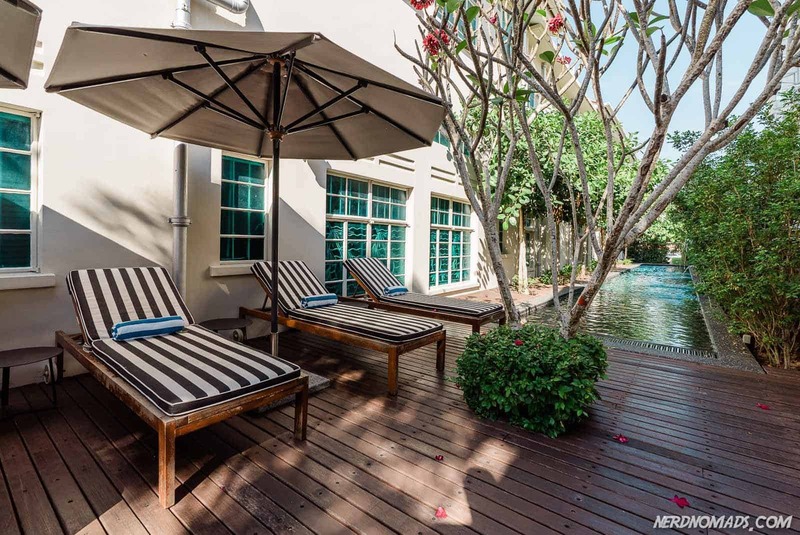 Its proximity to the old part of George Town makes it a good area to stay in if you want to frequently go into George Town but want to stay close to a beach. Tanjung Bungah is all about spending time at the beach. The only other sights here are the Toy Museum and the Floating Mosque. The huge Flamingo resort has been here for almost thirty years, and it is starting to look its age. But if you don´t mind the somewhat tired decor, it still has a certain old school charm. The staff has thankfully not lost any of their friendliness and service. The fantastic location, right by the beach and the large swimming pool are its standout features. Lost Paradise Resort is a charming small boutique hotel tucked away from the main road about 15 minutes walk away from Tanjung Bungah beach. It has an infinity pool overlooking the ocean and an excellent restaurant that serves up local specialties. Rooms are spacious and decorated in a lovely Bali inspired style. In an area dominated by large hotels and high rise buildings, this little resort is a refreshing exception. Bayan Lepas is a commercial and industrial area a short hop away from Penang International Airport that is often called the Silicon Valley of the East. We have traveled through here many times but never lived here. It is quite far from George Town (a roughly 30-minute drive) and it quite frankly isn’t the most exciting area. While it does have a few unique sights, I can´t recommend staying here as a base for exploring Penang. The sights of Georgetown and especially the attractions and beaches on the northern end of the island is just too far away. The exception is if you are in transit to or from the airport or if you are staying in Bayan Lepas for business. Snake Temple – A Chinese temple famous for being the home to a large population of venomous snakes. Most hotels in this area cater to a combination of business and holiday travelers. For a resort-style experience, take a look at the vast Hotel Equatorial resort with its enormous 46m(!) outdoor swimming pool, tennis court, squash, and spa. The hotel lies on a green hill overlooking Bayan Lepas surrounded by trails for running and hiking. The hotel provides a complimentary shuttle service to both Batu Ferringhi Beach and George Town. Would you like a room with its own in-room pool overlooking the sea? Sounds absolutely wild, but such are the suites at the Lexis Suites Penang. The suites are spacious and well designed with every modern comfort. And it is just five minutes from the airport. Olive Tree Hotel is a reasonably priced modern mid-range hotel with a rooftop pool. It has a in-house restaurant, fitness center and breakfast is good.Perfect for a quick stopover before an early flight. Well, there you have it! Our favorite Penang areas and hotels. 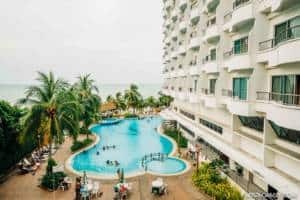 I hope this helps you decide where to stay in Penang and have given you some ideas on what hotel to book. At least you now know a little more about Penang’s best areas and their sights and attractions. You might still feel a little overwhelmed. Penang and George Town especially has more gorgeous boutique hotels and quirky, charming hostels than any place we know of. It´s part of why we love it so much, and why we did not want to leave any of our favorites out. Rest assured that no matter where you end up staying in Penang, Iḿ sure you will love it just as much as we do! We will expand and improve this guide continuously, so please comment below if you have any questions, suggestions or recommendations for anything we should check out next time. You can take the train, bus, car, or plane to Penang International Airport. Several air companies fly here, like AirAsia. Penang is a great place to visit all year round. High season is November to January, when the weather is best. February to April is a quieter time to visit Penang. May to October is the wettest season. George Town, the capital city of Penang, is a Unesco World Heritage Site. Penang has several nice beaches. Penang is famous for its fantastic food and street art. It is popular to head to the Langkawi Island from Penang (there are daily ferries and plane).